This week Soundtrax interviews Lalo Schifrin, whose new autobiography provides a springboard to explore the legendary composer’s experiences in film music – from Dirty Harry to Abominable, from favorite experiences like Cool Hand Luke to unpleasant ones like The Exorcist. Reviews include Spooks from Schifrin and Andy Garfield (“quintessential Schifrin”), Terence Blanchards’ Miracle At St. Anna (“arguably his strongest film music effort thus far”), Brian Tyler’s Bangkok Dangerous (“confident rhythms and drive keeps the score moving forward even in the midst of quieter moments of reflection”) and Eagle Eye (“supplies a very eloquent melodic theme that contrasts nicely against its more percussive, rhythmic action sensibilities”), Tribute Film Classic’s fine new rendition of Bernard Herrmann’s The Kentuckian (“quite cheerful score as it brings to life the environment of early 19th Century America and the confident optimism of its characters”), Steven Edwards Finding Rin-Tin-Tin (“a pleasing and wonderfully rich, organic musical texture that enlivens the film and its canine hero”), Murray Gold and Ben Foster’s music from BBC’s Doctor Who spinoff, Torchwood (“highly melodic, very expressive, and thoroughly likable on disc –one of my favorite soundtracks of the year), Manuel de Sica’s Cemetery Man (Dellamorte Dellamore), FSM’s 3-disc Shaft Anthology, combing the efforts of Isaac Hayes, Gordon Parks and Johnny Pate (“catchy, endearing, modernistic and, yes, soulful,”), and Taro Iwashiro’s masterful epic score John Woo’s Red Cliff (“Iwashiro’s poignant melodies and muscular eloquence give Red Cliff much of its dramatic gravitas and sensitivity”). Miklós Rózsa speaks in his autobiography of having led a Double Life, one foot firmly planted in film music, the other firmly established in classical music. Lalo Schifrin has led kind of a Triple Life – equally impassioned and influential in his endeavors in jazz, classical, and film music. Mission Impossible: My Life in Music, just published by Scarecrow Press, is the autobiography of Lalo Schifrin, detailing his experiences and perceptions in those three areas as a musician, composer, and conductor during a musical journey that took him from Buenos Aires, Argentina to the hallowed studio halls of Hollywood. It is an amazing collection of memories and perceptions and ideas and values about music, and a fascinating and often very personal experience to walk in Schifrin’s shoes over fifty years of memories (the book comes with an accompanying CD containing a variety of examples of different kinds of music). Film music actually comprises only two of the book’s 34 chapters (the emphasis is upon jazz, which remain his first and foremost love; the book is also a volume in Scarecrow Press’ “Studies in Jazz” so this emphasis is reasonable from both perspectives), and it becomes clear that Lalo’s talent and passion for music embraces all forms of music from jazz to classical to ethnic and his efforts in film scoring likewise encompass all of his musical passions. But his most significant film music works – his television themes for Mission: Impossible and Mannix, his film scores for Cool Hand Luke (1967), Bullitt (1968), Dirty Harry (1971), and Enter The Dragon (1973) – betray to their excellence the strong influence of jazz, even while other scores like The Fox (1967), The Four Musketeers (1974), and Voyage of the Damned (1976) demonstrate a firm grounding in classical symphonics. Using his autobiography as a springboard, I spoke with Lalo last week about his career in film music, asking about many of the significant stepping stones in his autobiography as well as touching on some lesser known scores that I’ve recalled fondly. We also take a look at his latest score, the “graphic novel soundtrack” Spooks (see review elsewhere in this column). Q: What led to your writing an autobiography? Lalo Schifrin: I decided to write this about two and a half years ago because I thought that I had something to say. There were many experiences I had in three fields of music – in jazz, in classical music, and in film music. So it was an idea like that. At first, I didn’t know if I wanted to publish it. But there was interest from the publishing house so I did it. Q: Reading the book, it’s clear that jazz is a huge part of what you are, personally and professionally, and in contrast there are only a couple of chapters that deal with your work in film. Looking back at your work in these three areas, jazz, classical music, and film music, how to you regard that particular part of your musical legacy? Lalo Schifrin: I have always been a film buff, since I was a child. Not only a film buff, but a film music buff. My perception of the contribution that music can make to a film started at a very early age. I remember as a child I went to see a horror film on a weekend – that was in Buenos Aires, a long time ago. I don’t remember what it was, but the following Monday, I went to grammar school, and during the recess I told my classmates that I had seen the movie and that without the music, it wouldn’t have been so frightening! I was maybe five or six years old, so the idea that as a child I paid attention to that detail shows you that I had been very perceptive about that – therefore it was not a coincidence I ended up writing up music for films! Q: Getting involved in film music in the late 1950s, as you did, that was right at the time when what had previously been primarily a very traditional 19th Century classical idiom in Hollywood film scores, was beginning to open up into jazz. What was it like getting involved in film music and being able to bring your interest in jazz into that? Lalo Schifrin: I think part of that was the fact that Hollywood was changing. Not only the music, but all the composers were getting older and there was a young generation of producers and directors who started to look for new approaches to sound. It wasn’t only jazz, but the advantage jazz had was that it had a pulse and a rhythm, and that created tension and for chases it helped a lot. It was more contemporary. The executives at the studios were also new and they were younger, so it was like a younger generation. Q: What prompted you to begin Aleph Records to release or rerelease of a lot of your scores on CD. Lalo Schifrin: Actually it was my wife who did it. I’m basically a composer and conductor and a performer, so I’m in the artistic part of the music, but my wife had the idea of the record business. Clint Eastwood’s attorney gave us the rights to release the Dirty Harry soundtrack, which didn’t belong to Warner Bros, it belonged to Malpaso Productions, Clint Eastwood’s company. Then we got the sequels, and as a matter of fact, we will soon release The Dead Pool. But because of that we started a precedent and it was easier to get to other companies. In some cases we couldn’t get the original soundtracks and I had to re-record it, like The Amityville Horror. I re-recorded it because the record company did not want to give me the masters. Q: Speaking of Amityville Horror, it’s interesting that you scored this and a number of other horror films over the years, since your very first awareness of music and the power of music in film was in a horror film, as you mentioned. Now, when you are scoring a scary film like Amityville, like The Manitou, or like The Abominable, what do you feel is necessary to create a score that will enhance the scariness of a film like that? Lalo Schifrin: You have to remember that movie is a part of a collaboration between the film writer and the director and the actors and the film editor and the cinematographer, it’s like a team, and we are all working for the same goal. We have different specialties. My specialty is music. Let me put it this way, it’s like a magic show. In a magic show, nothing is real. Horror movies – any movies – they are all make believe, so the music has to help that make believe sense, and that’s why I like to do it. Q: Do you think, in a horror film, or a fantasy or science fiction film, does music have a greater responsibility to create an environment or enhance that suspension-of-disbelief that, say, a comedy or a contemporary drama? Lalo Schifrin: That’s a very interesting question. I think in all of them music is important, but in a horror film or in a science fiction or fantasy the function of the music becomes perhaps more evident. Not more important but more evident because the audience is more aware. Q: I think, for example, on Rush Hour, those films are set in a contemporary environment, which is familiar to people as opposed to something like The Neptune Factor or Bridge Across Time where you’re musically creating an environment that doesn’t exist. Your music has to not only enhance the action but also sell the environment, the concept. Lalo Schifrin: You are absolutely right, you just hit it. As composers, we create imaginary environments. Even in realistic environments like in Rush Hour or Dirty Harry, they are still created. In a more realistic film, the sound effects are creating a sense of realism. But the music is as imaginary as in a horror film or a fantasy film. Q: Going back to the early days of Dirty Harry or Bullitt, what are your recollections of sitting down with Don Siegel on Dirty Harry or Peter Yates on Bullitt. Do you recall what your early impressions were that told you: this is the direction I should go it on these scores? Lalo Schifrin: I remember that the first impression I got exactly. I started to hear the score in my mind the way it was going to be. This is something very strange, and I don’t know if lay people can understand that. Composition is no different from any other creative endeavor. For instance, you are a writer and at this moment you are a writer of an article for film magazines, but there is no reason why you couldn’t write fiction, or you couldn’t write screenplays. In that sense, ideas would come to you and you hear the ideas in the language you know, which is the English language with grammar and syntax. You hear that. And I hear music; I know the grammar and the syntax in the music, I know the sounds. Let me give you an example. In Dirty Harry, we say that it is realistic film. It takes place in San Francisco, and there’s a very fortunate coincidence which is that the protagonists in both Bullitt and Dirty Harry, the characters played by Steve McQueen and Clint Eastwood, they are both inspectors of the San Francisco Police Department. However they are completely different personalities. On top of that, Bullitt’s enemy, the villains, which are very important – Alfred Hitchcock said that in a thriller the villain is more important than the protagonist. The villains in Bullitt are the political machine and all the elements. In Dirty Harry the only villain, and he’s a very good villain, is Scorpio, who is a crazy, crazy mass murderer and he’s totally insane. So he’s very dangerous, despite the fact that he is small and Clint Eastwood is big and heavy and strong. Scorpio is so mean, there’s so much evil, that he can accomplish terrible things. So I decided to have a female human voice doing a haunting sound, which is very creepy. Combined with electronic instruments, it gave a very chilling, eerie effect, which was very appropriate. You see, although it is a very realistic film: where are the voices? The voices are not in the streets, the voices are in the mind of Scorpio. He’s so crazy that he hears those voices. Q: The score balances the psychology of Dirty Harry, on the one hand, with this very muscular, confident, straight ahead rhythm, which is contrasted with the music for Scorpio which musically embodies his psychopathology. Lalo Schifrin: Yes, you are absolutely right. Q: When you’re using those kinds of themes, what’s your technique, at least in this film or say Bullitt, as far as integrating those themes thematically as the story moves along? Lalo Schifrin: You know, there is a theory about thrillers, in general, not only music but the films themselves. The theory is that there are three schools of thrillers: the American school, the French school, and the English school. In English films – and these are just generalities, because there is some mixing between the three of them. But the most important element in English films is suspense, that’s Hitchcock. The most important element in French thrillers is psychological. And the most important element in American thrillers is action. Before my time, a big movie that defined the action was The Naked City (1948), where you see Barry Fitzgerald, the detective, always in action – he’s going somewhere and solving the murder or the crimes, always going from one place to another, moving. So the first moment that we see Clint Eastwood is when, after the first murder on the rooftops where we’ve define the theme of Scorpio with a haunting voice, now we have Clint Eastwood on the move. He is the new Naked City policeman, and I did it with contemporary rhythms. Q: One of the unhappy Hollywood experiences you describe in your book was with your score for The Exorcist. You wrote a score that was an amazing, horrific, chilling listening experience – I can imagine how powerful that would be in the film. It’s unfortunate it didn’t work out that way. Lalo Schifrin: It was a very unpleasant experience. I had written the music for a 6-minute trailer for The Exorcist, and the film score was going to be like the music in the trailer. The director liked the trailer music very much. However, when they played it in the theaters there were people getting sick. The combination of the visuals and the music made some people get physically sick. So the head of the studio gave instructions to the director to tell me to tone it down for the score. He never did that, he never told me. So that’s why my score was thrown out. Q: Another potent horror score was your score for The Abominable, directed by your son, Ryan. What kind of rapport did you have working with him? Lalo Schifrin: The fact that he is my son has nothing to do with the way we worked together. He is a professional, and I worked with him the same way I would work with Don Siegel, because we had to decide what kind of music, where we start a cue, where we start a scene. He knew exactly what he wanted, he knew how to communicate. I had some suggestion and some objections, and we talked exactly like two professionals. Q: When you’re creating a score that is enhancing suspense, or fear, shock, terror, in a film like The Exorcist or Abominable, what do you feel is needed in a score to create scary music or music that will enhance the scariness of the movie? Lalo Schifrin: To create scary music is not difficult. We’re all part of the magic show and this is magic. Hitchcock , again, has given three examples of possibilities that you can do to create suspense. This is where spotting – to decide where music goes – becomes important. As I have said, it’s not difficult to write suspenseful music - the difficult thing is to decide what to do with it. Say there is a room with a closet, and inside the closet is a corpse. The audience knows there is a corpse in the closet, but the protagonist, walking into the room, doesn’t know. They walk to the closet and open it, and there is a corpse. So there are three possibilities to score this: One is what we call wall-to-wall. From the beginning, we build the suspense, and we keep building and building as they open the closet door and then there is a big horror climax – the accumulation of all the suspense that we’ve been building. The second possibility would be not to have any music and just sound effects and silence, until they open the closet door and then we have a big rush of horrifying sounds. And the third possibility would be so create suspense, building and building it, and when the door is abruptly opened the music stops suddenly. So, you see, the thing is not what to write but how to write it and in what context. Q: Does the same apply to comedy, such as when you scored Bringing Down The House or the remake of The Beverly Hillbillies? Horror and humor both depend on timing and these elements you’ve been talking about. Lalo Schifrin: The comedy obviously is already in the script and the acting. It’s not too difficult to score a good comedy film, because you don’t have o make it funny. I usually prefer not to write comedy music. In a comedy film I write realistic music, and let the comedy play itself, because otherwise it would be like a cartoon. Q: Exactly, you’re the straight man to the comedy. Lalo Schifrin: If you notice, what I do in most of those films is not to have any comedic music, per se. There could be some exceptions, some scenes that require it, but generally I’m staying away from the comedy. Q: You scored a horror film in 1978 called The Manitou, based on a then-popular horror novel by Graham Masterton that was based a lot on Native American mythology . Do you recall your approach to scoring that film? Lalo Schifrin: The most important element is the American Indian mythology, and I created suspense and built tension in the score based on those rhythms and that ethnic idiom. I based it on Indian rhythms and Indian mythology. I studied ethnomusicology, so that was easy for me because I knew the techniques. I enjoyed writing the score. It was a pity that the director [William Girdler] died in a helicopter accident shortly afterward. Q: You also scored Day of the Animals, a film that came about in heyday after Jaws, when we had all these films about animals attacking humanity, and you scored kind of the ultimate one, where all the animals turn against people. Lalo Schifrin: That was the same director as Manitou. That was the first film I did for him. The basic idea of the film was that the ozone in the atmosphere drives the animals crazy. It’s a fantasy. The action scenes were easy. The difficulty was to create an idiom for the film with this idea of the ozone danger. Q: There was also the contrast with the “great outdoors” music, these very natural, wonderful melodies of the forests and mountains contrasted with that element of danger led to a very interesting tonality to that score. Do you recall the kind of orchestration you did on this film? Lalo Schifrin: I think I used mostly strings and maybe some woodwinds. I don’t remember now if I had brass, but I had some percussion instruments, but they were metal instruments that the percussionist would play with bows of string instruments instead of using sticks or brushes. This let the metal percussion instruments ring… and that, added to the strings, created a very eerie sound. Q: Another very influential score of yours was Enter The Dragon, the Bruce Lee martial arts movie. Do you recall how you chose your initial ideas for that score and what elements you wanted to emphasize in the music? Lalo Schifrin: Well, again, being so acquainted with ethnomusicology and my familiarity with the music of the Orient helped me a lot. It also helped with the Rush Hour films. I wrote music that would be any other action film, but I based the melody on scales and sounds that came from the Orient. I didn’t use any ethnic instruments, but I imitated the ethnic instruments with the instruments we have in the symphony orchestra in the Hollywood studios. Q: In a film like that, where there are a lot of fight scenes – Bruce Lee fighting this guy, John Saxon fighting that guy – what was your approach to scoring the film’s fight scenes? What kind of music did the film need for kung fu fighting? Lalo Schifrin: The music of the Orient can be very mystical or mysterious, and I integrated that for the action scenes. I put action music together with the Orient and created a kind of new sound. Q: Returning to that idiom after twenty some years, with Rush Hour, what was your experience developing a similar kind of tonality in these new films? Lalo Schifrin: It made me feel a little more comfortable because I already knew the idiom. However, I didn’t take that for granted, and I tried to be as imaginative and as fresh as I was in Enter The Dragon. Q: Did Brett Ratner specifically cite Enter The Dragon when he asked you to score Rush Hour? Lalo Schifrin: Yes. He had seen Enter The Dragon when he was a child and he wanted me to score these movies because of Enter The Dragon. Q: One of your most influential scores is that for Cool Hand Luke. What was challenging about that score for you? Lalo Schifrin: That is one of my favorite scores. That was a different one for me because, although as I said I knew ethnomusicology, one thing I did not know too much was bluegrass music. So that was an adventure to integrate bluegrass into the score. It’s a Southern score and a magnificent movie, with action, lots of human interest scenes, and the acting is incredible. The director is the same director as Amityville Horror. But the existential story about the life in a prison, it was a fantastic music adventure for me. Q: Your most recent score is Spooks. Now this isn’t a film score, it’s a score for a graphic novel. So in this case you’re not scoring visual action, but enhancing the graphic elements on the page of a book. What, then, was your inspiration for that score? Lalo Schifrin: I must say my son, Ryan, who was the director, gave me all the instructions. I had no idea how to do it, but I did it, and he liked it! Q: Did you have any thoughts such as, “this music goes when they’re turning this page...” or anything like that? 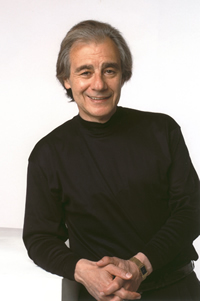 Lalo Schifrin: No, I wrote a general music that my son had asked for. He knew exactly what he wanted. Without him, I wouldn’t have been able to do it. Q: I understand they’re now making a movie out of it. Is it too soon to tell if you’ll be involved in that? Lalo Schifrin: Most likely, God willing. For the first time, a graphic novel has a sound of its own! Composers Lalo Schifrin and Andy Garfield wrote 20 minutes of score for the comic-turned graphic novel Spooks by Larry Hama (G.I. Joe) and Ryan Schifrin (Abominable). The music for Spooks is available via iTunes and on a special limited edition CD, with only 500 copies being pressed, exclusively by Aleph Records through their website www.schifrin.com (it can be heard streamed on the website www.spooksthecomic.com ). 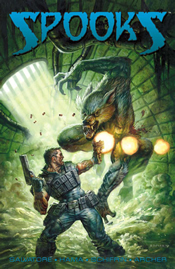 Spooks is a new military horror series from Devil's Due Publishing created by Ryan Schifrin, son of the famous composer. The music is a fascinating experience, although difficult to time to specific sequences in the graphic novel. But as general atmospheric music, it’s a splendid soundtrack. With their introductory tracks, Schifrin’s “The Forces of Darkness” and Garfield’s “The Department of Supernatural Defense,” both composers establish a vibrant, muscular, and action-oriented resonance for the story. Schifrin’s “Forces” is an aggressive, martial pounding assembly of brass and drums and strings, forcefully occupying territory in stalwart sonic measures, while Garfield’s “Department” is a cool Zimmeresque heroic theme, synth-brass over sampled choir and plenty of underlying activity in a riff that rolls confidently across the soundscape. But Schifrin’s next two tracks, “Omega Team” and “Zach and Felicia” are quintessential Schifrin and absolutely essential; the former an assertive synth vibe associated with the elite military team that confronts those forces of darkness, its twangy synth melody over a percussion-heavy rock/fusion beat; the latter a retro 60’s romance motif, light winds and keys over a sustained vibe of layered synths. Garfield supplies three more cues, the brusque and jarring spooky/scary “The Graveyard,” the pulsing and miasmic “Witch’s Manor,” and the choir heavy conflagration, “Headless Jack.” But Schifrin’s concluding “The Final Battle” dapples synths with samples to provide a thoroughly climactic and raging, drum-beaten sampled orchestral finale. At the San Diego Comic Con this past July, it was announced that Spooks will be adapted to a live action film by Men in Black producer Barry Josephson; time remains to see if the graphic novel score will become the movie score in due course. 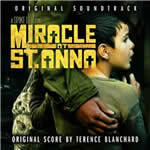 Terence Blanchard has composed arguably his strongest film music effort thus far with his score for Spike Lee’s Miracle at St. Anna, released online via Hollywood Records. Performed with a 98-piece orchestra, the score emphasizes strength in subtlety, as the score remains fairly subdued. It’s a quietly reflective and honorable score that emphasizes the film’s depiction of four African-American soldiers of the 92nd Buffalo Soldier Division during World War II. The soldiers become separated from their unit and trapped within the confines of a small Tuscan village after one of them risks his life to save an Italian boy. The story is inspired by the August 1944 Sant'Anna di Stazzema massacre perpetrated by the Waffen-SS in retaliation to Italian partisan activity. “I’m inspired by the story itself,” Blanchard said of Miracle. “Growing up in New Orleans, I remember the Buffalo Soldiers marching in parades and never realized the significant role their played in fighting for our freedom. It’s an honor to be part of a project that helps to relive and tell a small segment of what those soldiers dealt with in our history.” With Miracle, Blanchard resumes his collaboration with director Lee, for whom he has scored a dozen films, including the lauded HBO series, When The Levees Break: A Requiem In Four Acts, which spawned Blanchard’s Grammy-winning CD, A Tale of God’s Will (A Requiem for Katrina). The score is a sublime an intimately felt work, and one in which Blanchard has clearly invested his heart and soul. Far from the traditional World War II score, Blanchard emphasizes the overwhelming tragedy of warfare and the nobility of sacrifice through a number of hushed and mostly atmospheric symphonic tracks, culminating in the 12-minute tone poem, “War Is Hell,” which, through languid reflections of layered chord progressions punctuated by a recurring 4-note trumpet figure, develops a powerful and affecting tonality. At least seven separate themes are laced throughout the score, appearing on the CD in segments, but each are composed of similar cloth, quietly humble, expressive, and honorable, including a pleasing accordion melody for Renata, love interest of one of the soldiers, which beautifully captures the mood of old world Tuscany while embodying the character with dignity and strength of spirit. Only “Third Reich,” with its stiff and angular patterns of trumpets and snare, suggests traditional war movie scoring, but even this segues into a sustained evocation of reflective atmospherics. This is really an exquisite score with a great sense of feeling and respect. A pair of fine Brian Tyler action scores have both come out and are well worth hearing. The first, for Oxide and Danny Pang’s remake of their 1999 actioner, Bangkok Dangerous, is a splendidly moody and atmospheric action score that, even in the midst of its often frantic action, evokes a quiet spirit, much like the urban Thailand environment of the film itself. Released on CD by Lionsgate, the film is a departure for the Pang Bros, who have been best known for their j-horror films like The Eye and Re-Cycle. The new version of Bangkok Dangerous stars Nicholas Cage as a hitman who's in Bangkok to pull off a series of jobs but falls for a local woman (in the 1999 original, the gimmick was that the hitman was also deaf; a facet discarded for Cage’s role in the 2008 film). Tyler’s score is large scale action and intimate expressiveness all in one. With only slight musical references to the Orient through subtle bells and gongs, Tyler approaches the film as a contemporary action thriller, his emphasis upon rhythm and tonal atmosphere. His main theme is evoked with layered strings massing in a slow cadence, the melody taken by distant keyboard notes wrapped in a hushed breeze of violins. The main theme often wafts with confident slowness over a semblance of muted gongs and modernistic electric tonalities; evoking an striking contrast between the Orient’s fusion of old and new. The score will contrast a reflective motif for Fon, the local woman who Cage’s assassin falls for, with heavy, contemporary, urban rhythms and textures that are associated with the hitman, his activities, and the modern environment in which he works. Action cues are built around hefty rhythms and modern textures, with the main theme laced through the musical activity like a solidifying rebar, tightening the music’s strength and keeping the cues’ elements together and uniform. Bangkok Dangerous evokes a very intriguing sound texture throughout; its fusion of urban electronic grain and moody synth riffs along with subtle nods to the percussion styles of the Orient give the score a timbre that is very appealing and fresh, while its confident rhythms and drive keeps the score moving forward even in the midst of quieter moments of reflection. 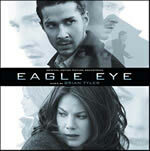 Tyler’s score for Eagle Eye, another big action film, has been released by Varese Sarabande. The score also supplies a very eloquent melodic theme that contrasts nicely against its more percussive, rhythmic action sensibilities. A contemporary thriller starring Shia LaBeouf, Michelle Monaghan, and Rosario Dawson, the score is less subtle and textured than Bangkok Dangerous, but it builds a muscular dynamic that is quite potent. The music generates a progressive rhythmic propulsion from start to finish, opening with a powerful horn version of the main theme over staccato synths and percussions. The low baritone of the French horns is especially eloquent, and contrasts nicely with the somewhat urban-industrial texture of the percussion. Raging snarls of trombones punctuate the omnipresent drum beats that drive the music forward at a constant high speed, while Tyler’s very expressive melodic theme gives the music its soul in the midst of its frantic momentum. “Escape” builds a nice orchestral feel with arpeggios of strings and harps lending a cool texture to a very driving action cue. “Chutes” and its corresponding cue “Ladders” both build a nice action vibe, bolstered by the score’s ubiquitous pounding percussion sensibility and its overarching melodic flavoring. More intimate, reflective moments stand out against the rhythm’s forward thrust – “Honor” builds a compelling melody for synths and strings that evokes all that its title implies; “Arlia” develops a nice brooding mysterioso, haunting synth voicings beneath a melancholy trail of strings; “Loss of a Twin” houses a poignant piano respite over strings, mournful and reflective. And throughout all the main theme makes its presence felt with its persuasive rhythm and melodic influence. “Copyboy” proffers some cool urban textures with its electric guitar soloing. Eagle Eye’s “End Title” is quite compelling, especially after all of the previous metallic percussion tracks; it’s a pleasing electric guitar version of the main melody over punchy drumkit and loose synths, sounding vaguely triumphant/heroic, but probably more relieved that the pressure is off. Kentucky widower bound for 1820's Texas with his young son. The film is a coming-of-age story for both father and son, who find themselves up against a quandary of obstacles keeping them from having the means to travel on a steamboat to Texas, the faraway land of opportunity that awaits them. “Herrmann's score provides both wistful and spirited insight into frontier life in 1820s America,” says Tribute producer Anna Bonn. “The Kentuckian intertwines many of his compositional styles into an Americana-themed score with undeniable trademark Herrmann characteristics.” Tribute score reconstructionist John Morgan adds, “Since this 2008 rerecording would include all the music Herrmann wrote for the film and would contain forty-eight separately titled cues, we put many of the short cues together without pause to maintain a solid, rewarding listening experience. Due to Herrmann's inherent musicianship, these cues fit together beautifully...” For those familiar only with Herrmann’s darkly brooding scores for Cape Fear and the Hitchcock movies, The Kentuckian will come as a pleasant surprise. It’s bright, spritely, and quite cheerful score as it brings to life the environment of early 19th Century America and the confident optimism of its characters. There are some darker moments, associated with those Kafkaesque obstacles that keep Lancaster from achieving his goals (such as the dark-hewn psychological atmospheres of “The Jail” and “Anger”), but the overall mood is definitely one of folk-drawn eloquence and grace. Herrmann’s “Prelude,” for example, opens with galloping heraldic figures of horns and oboes that culminate in a graceful chord progression of soft winds, foreboding cadences that herald less cheerful events to follow. The introductory motif recurs in “The Stagecoach” and we’re off, introducing Lancaster and his son on their way to Texas. The foreboding cadences from “Prelude” recur in “Dexter” and become associated with the wicked tavernkeeper in an early scene. Another set of villains, “The Fromes,” are escorted by a sinister darkness of low strings and winds. But the film’s primary baddie, Stan Bodine (Walter Matthau) is introduced with a reprise of the opening horn motif, which Herrmann slowly unwinds to represent his preferred means of communication, “The Whip.” The dark intonations cling to Bodine like thick oil, resonating darkly and with intricate sinews of rhythmic liquidity. “The Forest” is an expressive slow air that undulates with the breath of the outdoors; a similar phrasing recurs in “Morning and Night,” which shines with an attractive harmony reflective of both light and shadow. Herrmann’s wonderfully descending trills of flutes and strings at the end of “River Queen” introduce a pleasant honky tonk piano melody, “Saloon Piano.” A rich piece of Americana sparkles through “The Steamboat” and “Welcome Aboard,” a pair of cues whose music drifts through a kaleidoscope of orchestral colors, from pure Americana, angular jazzy rhythms, into a jaunty square dance melody. The score navigates through these and many more motifs, colors, and harmonies and is a thoroughly agreeable recording of a fine score. The album is balanced by a premiere recording of Herrmann’s score for the 1957 historical documentary, Williamsburg: The Story of a Patriot, which makes a fine companion to The Kentuckian. For this film, which dramatized the unrest of colonial America against English taxation and has run continually since 1957 at the Patriot Theaters in Colonial Williamsburg (VA), Herrmann adopted a pure American classical score, with prevalent reference to folk tunes of the period, performed by an oversized chamber ensemble. With Mysterious Island, Fahrenheit 451, She, and now The Kentuckian under their belt, with Charge of the Light Brigade and Prince and the Pauper soon to come, Tribute Film Classics has fulfilled its emergence as a major label of relevant and significance restorations of classic film scores. 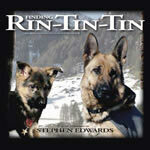 Finding Rin-Tin-Tin is not a new fictional adventure starring the famous German Shepherd animal star of the 1920s and 1930s cliffhangers, but rather unfolds a similar adventure while telling the true story of how the canine was found by American pilot Lee Duncan in France during World War I, was trained as a member of his company, and later became the most famous animal star in Hollywood history. Directed by veteran producer Danny Lerner, the movie stars Tyler Jensen and Ben Cross, with an orchestral score by Stephen Edwards (Feast, also several previous projects for Lerner). The score has been issued online and as a limited edition CD from MovieScore Media. Edwards chose an old fashioned orchestral approach befitting the film’s time period and, as he puts it on the liner notes, “gives the film a classic matinee feel.” Edwards convinced the director to accumulate the budget to provide for an orchestral score (the Belgrade Film Orchestra did the honors), which results in a pleasing and wonderfully rich, organic musical texture that enlivens the film and its canine hero. Edwards introduces his primary “Rinty” theme in the Main Titles, initially very playfully, and then allows the theme to mature as the dog grows from a puppy to a mature dog; it reaches much of its full-bred maturity in the montage music for “Rinty’s Training.” The main theme also captures an appropriate Great Escape-ish military sensibility through its use of paired flutes as a prominent component of the theme. “Rinty the Hero” arranges the theme with the jaunty pageantry of a hero’s march. A secondary “friendship” theme is used to represent the kindred relationship the dog forms with various people he meets (introduced furtively in “Enemy Dog Trainer,” enriched fully in “Rinty’s Training” and “Baby Back Ribs”). With much of the film’s action being comedic, there’s an amount of quasi-cartoonish music with precise writing to picture; it fits nicely and adds to the matinee entertainment feel of the film. One of the best of these is “Rinty Raids Kitchen,” a marvelous comic action romp, almost cartoonish in nature, but appropriately so for this amusing sequence; “Poker Fun” is another entertaining cartoon moment, as is “Post Pee Chase,” which leaks havoc all across the orchestra. Other cues become quite dramatic, such as the severe intonations of horns in “Baby Back Ribs” and the enjoyable histrionics of “Avalanche.” Edwards also enjoys the opportunity to include a number of Steiner-ish quotations from period tunes (“Johnny Comes Marching Home,” etc.) and anthems of the 1st World War era, which are interpolated nicely into the score. Whether or not you’re a fan of the BBC’s Dr. Who or its new sister series, Torchwood, Silva Screen’s release of the Torchwood soundtrack, scheduled for October 14th, is a must-have for film music buffs. 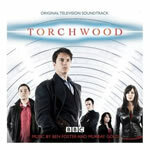 An assemblage of full-blooded orchestral compositions from Murray Gold, regular composer on the new Dr. Who since Season 2, and his arranger/conductor Ben Foster, the Torchwood soundtrack features an array of powerful and attractive dramatic melodies. More of a contemporary thriller than its Tardis-traveling bigger brother, Torchwood (the title is an anagram of Doctor Who) has to do with Captain Jack Harkness, the former Time Agent and con man from the 51st century last seen traveling with the Doctor, who ventures to early 21st century Cardiff where he becomes a member of Torchwood Institute, a renegade criminal investigation group founded by Queen Victoria to battle hostile extraterrestrial and supernatural threats. The thrust of the music, therefore, is more of contemporary action vibe that Dr. Who’s more overt fantasy and science fiction accommodations. The score is edgier, often included a rock and roll pulse, and not just a little “swagger and fun,” as exec producer Julie Gardner puts it in the CD notes. While Gold and Foster share equal billing, and tracks are not authored, it is reported that the bulk of the composition on Torchwood is Foster’s bailiwick, and here he shines. The music is highly melodic, very expressive, and thoroughly likable on disc, with a myriad of really beautiful melodies (the first part of “The Hub,”). The score introduces, accompanies, and often says goodbye to major characters while supporting the show’s action with a solid contemporary vibe (as with the full-on strings and percussion of “The Chase” and “The Mission,” the latter punctuated by regular oozing horn intonations; “The Plot” places a slowly weaving string theme over a low pad of percussive synth). All of the character themes are lovely melodies, very nicely nuanced and relayed (Jack, Toshiko, Owen, Gwen, Rhys, Weevil, Gray – the latter featuring an especially evocative vocal from Annalise Whittlesea, all displaying engrossing melodies and performances), while the main Torchwood theme is a straight ahead action rendering for keyboards and percussion over a very interesting bed of active synth textures. Captain Jack’s Theme, which comprised the show’s title music, is modern, confident, maybe even a tad arrogant, and contrasts nicely with the audacious poignancy of many of the show’s melodies and motifs. “Ghosts” proffers some really cool eerie sliding strings and spooky reverberated violin. “Sleepers, Awake!” features recurring dynamic descending string figure over pounding percussion with tiny, imbued fills of electric guitar giving it a compelling texture. “Another Day, Another Death” exudes such a sense of poignant beauty through an array of slow synths, strings, piano, and reversed samplings that even in its melodic austerity it becomes immensely powerful. This is a fine collection of enriching film music with a multitude of highlights. It’s quickly become one of my favorite soundtracks of the year. 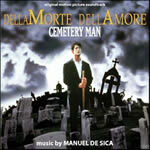 Michele Saovi’s Cemetery Man (Dellamorte Dellamore, 1994) is an unusual and humorous take on the modern zombie genre. Rupert Everett plays the mild-mannered watchman of an Italian cemetery in which the dead keep coming back to life, causing him to have to dispatch and rebury them regularly, aided by his half-wit gardener/maintenance man, until both fall in love with soon-to-be-zombified ladies. The film is compellingly funny and intriguing, its stylish approach and wit overcoming some deficiencies of plot. Manuel de Sica (the very classy Garden of the Finzi Continis) has provided a sumptuous musical score that enhances and plays up the film’s self-assured conceit. Digitmovies has enhanced and remastered its 1995 premiere soundtrack release of 25 tracks with this new enhanced “complete score” edition of 34 tracks, adding mostly alternate, extended, and suite cues. De Sica thoroughly supports the films notions of mad love, carnage and grue, surrealism and comedy. The music is mostly synth enhanced with some acoustic instruments and electric guitars, but like the composer’s scores for his father Vittorio’s movies, de Sica approaches the subject with sensitivity. On the one hand, a track like “The Rest of the World (Doesn’t Exist)” is plain eerie rhythmic atmosphere, but it also captures an essence of passionate solace and comfort as the hero embraces his situation through to its final comeuppance. The main title theme is an energetic mélange of synth tones flying about like the leaping limbs of awakened corpses emerging from the ground, almost playfully macabre in texture and sound. “Buffalora’s Cemetery” creates a creepy atmosphere for the protagonist’s charge, a large hillside cemetery in rural Italy. “Will I See Her Again?” reminds me a bit of The Living Dead at Manchester Morgue, another significant Italian zombie movie, with its steady rock-based undercurrent and dominant electric guitar riffing over the top. “Ignis Fatuus” achieves a good deal of creepiness also, using a plodding melody for high-end synth; a similar eeriness is established in “After the Fly,” with echoing twangs of electric guitar. “The Moon on the Island of Death” is essentially a spooky track, with theremin-like synth delineating a creepy melody over thick synth chords, but it captures a delicacy through flavors of harps and piano that makes it quite compelling. “Run of the Death Motorbyke” is a moody rock tune for harsh synth tones and percussion below angular, slowly soaring electric guitar figures; a disconsolate measure for terror on two wheels. “ ‘She’ Returner” captures an effective chill with throbbing low synths and menacing synth tones as one of the ladies returns, post mortem. “The Death That Lives” and its counterpart, “The Life That Dies” house a similar tonality. “Shoot the Living” and “Stolen Murders” are both occupied with bursts of staccato percussion, the latter segueing into a drawn-out semblance of sustained undulating synth. The alternate version of the former is even more manic, with processed gleeful voices enhancing its madness and mayhem. Willie Dynamite (1974), and lots more. While both Galt McDermott’s Cotton Comes to Harlem (1970) and Melvyn Van Peebles’ Sweet Sweetback’s Baadasssss Song (1971) preceded Shaft, neither of those films or their scores had the phenomenal effect that Shaft and its music did; the explosive blaxploitation trend and its style of music that took off like a beautiful, shiny Cadillac with the pedal down was clearly a response to Shaft. “In one fell swoop (all encapsulated in the title theme), Hayes began a number of trends: 1970s crime film and TV music (the wah-wah guitar and backbeat), disco (high-hat cymbals), rap (the spoken-sung nature of the lyrics), and ‘70s soul (the sensual baritone of artists like Barry White, as well as the lush orchestrations,” writes Lukas Kendall in the CD booklet. The music, especially Isaac Hayes’ score for Shaft but also the subordinate efforts of Parks and Pate, is very likeable, build around the urban rhythms of R&B and soul music, and provides effective if somewhat stereotypical music for the short-lived blaxploitation genre, and it’s well served by this well compiled anthology. The Shaft scores, while embodying urban songlike rhythms, are more than “song” scores; they adopt R&B/soul’s musical milieu and set it to work the way symphonies were used two or three decades before in crime dramas and film noir. The music is catchy, endearing, modernistic and, yes, soulful, and this is a splendid package proffering a fine gallery of almost all of it. Silva Screen’s latest compilation is The Essential Harry Potter Film Music Collection, containing a fine assortment of music from each of the (so far) five Harry Potter movies spread across two discs. Very finely performed by the City of Prague Philharmonic, conducted by James Fitzpatrick (3 tracks by Nic Raine), the first disc contains the John Williams’ exuberant and enchanting music for Sorcerer’s Stone (under its English title, Philosopher’s Stone), Chamber of Secrets (as adapted by William Ross), and Prisoner of Azkaban, while disc 2 contains Patrick Doyle’s Goblet of Fire and Nicholas Hooper’s Order of the Phoenix, both of which elaborate Williams’ initial ideas into new but compatible styles of their own. Disc 2 also includes a closing reprisal of Williams’ “Hedwig’s Theme” which makes a suitable coda for the collection. The double disc set is thorough yet concise, gathering the significant thematic and cinematic moments of the five films into a very likable collection of fine film music. 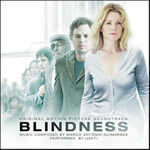 Decca has released the soundtrack for the new film Blindness, starring Julianne Moore and Mark Ruffalo. UAKTI, a Brazilian instrumental quintet formed in 1979 and heard on Paul Simon's album The Rhythm of The Saints, have provided the evocative score, composed by bandmember Marco Antônio Guimarães. The band is known for using custom made instruments, built by themselves, which lends a great deal of personality to the group's minimalist musical style. Of these, marimbas and string instruments are prominently featured throughout the soundtrack and are used to create a simple, eerie theme that lingers through most of the tracks. The score therefore maintains a very unusual sonic atmosphere, especially for this kind of a speculative thriller (film is about a doctor's wife [Moore] who becomes the only person with the ability to see in a town where everyone is struck with a mysterious case of sudden blindness. She feigns illness in order to take care of her husband as her surrounding community breaks down into chaos and disorder). The acoustic sonority of the score occasionally recalls Latin elements, occasionally suggests gamelan, occasionally suggests minimalism, but constantly provides a very intriguing and fascinating sound. The music glimmers and paints a unique tone poem for the film’s sightless intrigue. John Woo returns to Hong Kong and his martial arts roots with Red Cliff, a massively spectacular epic actioner, based like The Three Kingdoms: Resurrection of The Dragon earlier this year on the historic Battle of Red Cliffs during the fall of the Han dynasty in Chinese history. 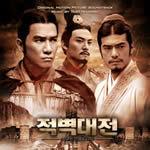 Woo’s film (which is actually the first of two parts, the second film as yet completed) has plenty of breadth and scope, expressed through a marvelous cast, intricate set design, and immense, epic battle sequences that are humanized by political intrigue and character interaction as each side of the battle is harmonized by effective character development. Tarô Iwashiro (Azumi, Shinobi) provides an expressive and epic-styled musical score that is fully symphonic with few ethnicities. The soundtrack has been released in Japan and Korea (pictured) on Avex Trax records. Built around a lavish, soaring theme, Iwashiro captures the pageantry, triumph, sacrifice, and noble tragedy of the nearly constant warfare that was China circa 180 A.D. Red Cliff is a war film score but it’s not so much about war nor the battles and assaults that make up the warfare depicted in the film; like Woo’s magnificent picture, it’s about brotherhood, valor, bravery, and honor – all facets the score richly supports through eloquent melodies and orchestrations, and moments of poignancy that are quite affecting (as the tender flutes and oboes of “In Loneliness”). “Precious One” is a soft splendor for strings and winds that merges into a quiet variant of the main theme, reflective and innocent. “Hill of the Refugees” is rich in honor and respect, reflecting the effect of the war upon the newly homeless seeking shelter after the destruction of their homes and villages. “Tricky Mischief” is a cute composition for playful winds accented by strings. “A Hero and A Boy” opens with a solo flute rendition of the main theme – played in the film by a young boy whose performance affects the Tony Leung character when we first meet him – that is joined by strings to reflect the honor bestowed on the boy and his father by Leung’s Zhou Yu. The score’s battle music is massive; battalions of deep drums beating formations of strings and horns in confident but eloquent aggression, melody merging with march, a softness around the edges of the savage. “Just Offensive Attack” is especially appealing, with a lyrical sonority that is quite affecting. “Closing In on the Enemy” wafts with a compelling circulation of violin notation before opening into a rhythmic attack theme driven by percussively metallic clangs and a cadence of strings bolstered by phrasings of brass. “Battle to Battle” is heralded by a masses array of shouting brasses and flowing strings, slowly pounding drums building to a powerfully reflecting version of the main theme, which pauses and recommences with a confident aggression and fuming clout as the attack commences. The 14 score tracks are concluded by a very nicely arranged 7-minute pop theme song variant on the main melody, sung by upcoming Asian songstress alan. Iwashiro’s poignant melodies and muscular eloquence give Red Cliff much of its dramatic gravitas and sensitivity. It is well distilled into its essential elements on the soundtrack which is a very pleasing release and one well worth seeking out on amazon or via google. German-born film composer Marc Streitenfeld has reunited with director Ridley Scott to score Scott’s newest film, Body of Lies. This is Streitenfeld’s third score in a row and eighth consecutive music collaboration with Scott. Streitenfeld traveled to Morocco to collaborate with Scott for this intense and sophisticated film, which required a score to support its strong and urbane style. Streitenfeld used a 90-piece orchestra as well as woods and choir to create this edgy but also moving score. Body of Lies is a film adaptation of the 2007 novel by American writer and journalist David Ignatius, and is about a CIA operative (Leonardo DiCaprio) sent to Jordan to track a high-ranking terrorist. The spy is aided by the head of Jordan's covert operations (Russell Crowe) in an uneasy alliance that leads to a cultural and moral clash between the men. The film will hit theaters on October 10, 2008. Born in Munich, Germany, Streitenfeld relocated to Los Angeles at the age of 19, first working briefly as a musical assistant for composer Hans Zimmer, then independently as a music editor and supervisor on several blockbusters. Streitenfeld was nominated for a Golden Reel Award for his work on Ridley Scott’s Kingdom of Heaven and was nominated for a BAFTA award for scoring American Gangster. Streitenfeld has had a long relationship with the award-winning filmmaker. “I’ve done quite a few films with him now and every experience has been really good,” Streitenfeld said. Prior to his work as a composer, Streitenfeld had collaborated with Scott as music editor, music supervisor and technical score advisor on several projects, including Matchstick Men, Black Hawk Down, and Gladiator. 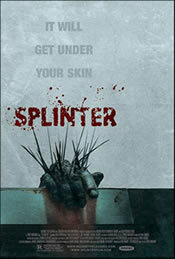 Elia Cmiral has created a haunting score for Splinter, the first full-length film by award-winning director Toby Wilkins. In the film, a convict and his girlfriend carjack a couple on a weekend retreat in the woods. The couples soon find themselves trapped together in an isolated gas station, on the run from a deadly parasite that occupies the woods outside. The film will be the centerpiece of the ScreamFestLA film festival on October 16, 2008, and will subsequently open in theaters on October 31. ScreamFestLA, a film festival devoted entirely to the horror genre, showcases some of the best independent short and full-length horror films each year. Splinter director Toby Wilkins won Best Horror Short for his film Staring at the Sun in 2005, garnering the attention of producer Sam Raimi, who then chose Wilkins to produce, direct, and write a number of short films for his production company, Ghost House Pictures. This year, the festival runs from October 10th to October 19th at Grauman’s Mann Chinese 6 Theatres in Hollywood, Calif. No stranger to the world of thrillers, Cmiral scored Tooth & Nail and The Deaths of Ian Stone, both featured at last year’s After Dark Horrorfest. Most recently, he finished scoring Pulse 2: Afterlife, the sequel to last year’s Wes Craven film, Pulse, for which he also wrote the score. Composer Jeff Beal brings his unique talents to the Western genre when Appaloosa, released through New Line, opens in theaters September 19th, soundtrack available onLakeshore Records September 30th. In addition to Beal’s score, the film features the song, “You'll Never Leave My Heart” sung by the film’s director and co-star Ed Harris; music by Beal and lyrics by Harris. In describing writing music with Harris, Beal explains, “It’s fun to hear this voice come out of him in character. He's a natural! We tried to make it feel like a classic cowboy song from the 50's.” Beal first worked with Ed Harris on Harris’ film directorial debut, Pollock. Howard Shore will be scoring the much anticipated drama Doubt, starring Philip Seymour Hoffman, Meryl Streep, and Amy Adams. The film, which is set in 1964 and tells the story about a nun who confronts a priest after suspecting him of abusing a black student, is directed by screenwriting veteran John Patrick Shanley, who won the 1988 Oscar for his Moonstruck script. Shore replaces Philip Glass as the composer on Doubt. Saw franchise composer Charlie Clouser is now attached to The Stepfather, a remake of the 1987 horror film. Nelson McCormick (Prom Night) directs the new film. The film, about a seemingly normal guy who goes to the extreme to find the perfect family, will reach screens next fall. 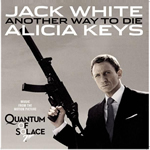 J-Records is set to release David Arnold’s Quantum of Solace score on Oct 28th. Silva Screen will be releasing Murray Gold's music for series four of Doctor Who in November. This much anticipated collection will include Song Of Freedom, the stirring choral piece that celebrated the defeat of the Daleks in the final episode of the series. Harkit Records has reissued the original soundtrack by John Barry to the 1966 Bryan Forbes comedy The Wrong Box. La-La Land has just released a new, limited edition (3000 units) of Jerry Goldsmith's complete score for the 1991 docudrama NOT WITHOUT MY DAUGHTER, starring Sally Field and Alfred Molina. Along with the complete score, the disc features a suite of Goldsmith's orchestra-only cues. Verita Note Records of Japan has issued an expanded soundtrack to Ennio Morricone’s The Big Gundown. The release is the same as the 2001 GDM release, except that 13 of the 24 tracks are in stereo for the first time. Three new Italian soundtracks have been announced by GDM from Hillside Productions. All are limited editions of only 500 copies. Robby Poitevin’s Killer Calibro 32 (32 Caliber Killer), Alfonso Brescia’s 1967 Italian Western, Stelvio Cipriani’s war movie score, La Lunga Notte Dei Disertori (1970, aka Overrun! ), and Cipriani’s Western scores for Testa T'ammazzo, Croce... Sei Morto Mi Chiamano Alleluja (They Call Me Hallelujah) / Il West Ti Va Stretto, Amico... E' Arrivato Alleluja / (Return Of Hallelujah). In October Cinevox will be releasing new versions of classic Eurohorror scores. Goblin’s classic 1979 score for Buio Omega (aka Beyond the Darkness) gets a deluxe edition comprised of 24 tracks including about 12 minutes of unreleased score. This version is unique from the previous 1997 edition as it includes the album in an unheard stereo mix. “Goblin created a perfect atmosphere to suit Joe D’Amato’s weirdo slasher masterpiece,” notes Cinevox. “Prior to the 1997 release, tracks from it only appeared on a rare 7″ and on the 1995 compilation Hits, Rare Tracks and Outtakes. Cinevox is also set to re-release one of Ennio Morricone’s greatest Giallo scores L’ Uccello Dalle Piume Di Cristallo (aka The Bird with the Crystal Plumage). Recorded in 1970’s for Dario Argento’s debut thriller, it’s from Morricone’s brilliant Giallo period with conductor Bruno Nicolai, and featuring Alessandro Alessandroni’s choir. This version will also be unique to the prior versions, as it will have a full stereo mix of the album, and will include a few unreleased tracks. Both of these albums are set to be released mid-October, and can be downloaded from http://www.cinevox.it. The new “Coppola Restoration” version of all three Godfather movies, released as a 5-disc DVD and Blu-Ray set last week, retains the disc of featurettes from the 2001 box set, including “Music of the Godfather” – a 6-minute documentary on composer Nino Rota, who did the score for the first two films, and one on Carmine Coppola, who did incidental music in all three films and the score of the last film. The section on Rota is based on a tape recording Coppola made in 1972 when he met with Rota to discuss the music. Sound quality is poor but there are supposed to be subtitles. The disc of new featurettes, while fascinating, does not cover the music in any greater extent.